Food labels are often included to make the public knowledgeable about what they’re putting into their systems. However, the emphasis placed on calories in America is something which potentially propels the existence of eating disorders and does little to reduce obesity. The advertisement had no way of knowing that the calorie count of the food and drinks I’m putting into my system is always on my mind, and I know I’m not alone in my irrational fear of food. But in that moment, as I stand at the base of the vending machine — black, bold letters dauntingly staring down at me — my fears, and the fears of so many others, feel invalidated. Here I am, being told to do something I do consciously and unconsciously every day. Don’t get me wrong, I understand the principle behind it. I understand that this is another method being implemented to address America’s obesity epidemic, but in the process, the concurrent epidemic of eating disorders seems undermined to me. Methods to prevent and decrease obesity are omnipresent these days in America. For every McDonald’s that exists, there seems to be some type of advertisement against it trying to deter people from going. Documentaries, posters and stickers everywhere emulate what I saw in Olin. Open discussion in health classes and TV advertisements address America’s obesity epidemic on a daily basis. According to The Lancet, a respected, peer-reviewed medical journal, approximately 160 million American adults, or 60%, fall into the category of being obese. Meanwhile, an estimated 30 million Americans have been diagnosed with an eating disorder according to a study published in Biological Psychiatry. The true number of Americans living with an eating disorder is impossible to know, though. Not everyone who has one has been diagnosed, and not everyone who has one is willing to admit that they do. The fact that, on paper, obesity is more of a widespread issue should not undermine the importance of addressing America’s epidemic with eating disorders, especially when the National Eating Disorders Association said the issue seems to be growing. All the work being done to counteract obesity in America is great and much-needed, but at the same time, some of it works to propel the existence of eating disorders. Bolded calories on restaurant menus, reminders to check calorie content and an overwhelming cultural emphasis on exercise and healthy eating come to mind as just a few ways that addressing obesity negatively impacts those with eating disorders. Of course, this not the intention. And of course everyone with an eating disorder has different triggers, but constant exposure to these kinds of nudges in health-conscious, body-centric society undoubtedly has the ability to impact people, even if it’s on an unconscious level. So, what’s being done, if anything, to counteract eating disorders ? In my experience, and I’m sure in the experience of many others living with an eating disorder of any kind, little to nothing. In health classes, an overwhelming amount of time is spent talking about obesity, especially in regards to nutrition and eating the “right” foods and getting adequate exercise, whereas eating disorders are merely a topic which is touched upon. In order to get real knowledge about eating disorders at the same depth as what’s taught about obesity in health classes, students have to take a psychology class. At the elementary, middle and high school levels, health classes are required, but psychology classes are not. On this wavelength, at least some education regarding obesity is guaranteed, whereas knowledge regarding eating disorders must be sought out. Bulimia and anorexia are probably the first things that come to mind when one hears the term “eating disorder,” but eating disorders are not limited to these two forms. Binge eating disorder, which involves binge eating without the purging seen in bulimia, often manifests physically to contribute to obesity levels. Despite this, binge eating disorder is just as much an eating disorder as bulimia and anorexia. The fact that it doesn’t appear physically with the emaciation people all too often think of as a qualification for an eating disorder does not impede this. Eating disorders and obesity can be tackled concurrently, even though they seem to oppose one another. Physically, sometimes they do. But mentally, that’s not always the case. I’m not saying everyone who struggles with obesity has an eating disorder, but what I am saying is that by only addressing the way obesity is physically manifested in this country, we’re overlooking so much. Telling people to exercise often and eat right doesn’t mean they’re going to do it. Especially if the message is overstated, people have a tendency to ignore it. Tacking a calorie count onto a menu or a package means nothing if people aren’t properly educated on what those numbers mean. More than that, it gives power to a number that is meaningless to some and means everything to others, thereby making it a self-destructive method. Eat right and exercise often are two messages that are supposed to target the community of Americans who don’t eat right and who don’t exercise often. But based on data, it seems that, more often than not, those two messages bypass the targeted community. The community that listens, instead, is the group who maybe eats a little bit too right and exercises too often. Messages reach an audience who wants to hear them. And in America, the audience who wants to hear this message is the group of people looking to confirm that their disordered eating is doing something productive for them. I know because I’ve been there. The vending machine in Olin told me, for a split second, that my desire to check the calorie content on my food was what I should be doing. But, considering the stage of recovery I’m in, it really wasn’t. The healthiest option for me would be to ignore the calories. But media makes it out to be the opposite. Health rules become generalized, which is part of what feeds into eating disorders. The recommended daily amount of exercise is around 30 minutes per day, but someone who’s recovering from an eating disorder shouldn’t necessarily be exercising at all if exercise addiction, as it often is, was a component of his or her particular disorder. But, seeing signs and messages about exercise everywhere they turn can make individuals feel as if they’re doing something wrong by recovering. Of course, there are exceptions to every rule. But eating disorders aren’t an exception to generalized health rules that America streamlines everywhere. Maybe they impact a minority of the country, but the numbers are growing, and the way we’re going about tackling obesity might be one of many factors playing into that. The current solutions America is implementing to combat its growing obesity problem are not working. They’re failing to reduce obesity rates and eating disorder rates are rising in the process. There’s no question that something needs to be done in America to ensure the health, livelihood, and quality of life of its citizens, but we’re going about the issue in the wrong way. 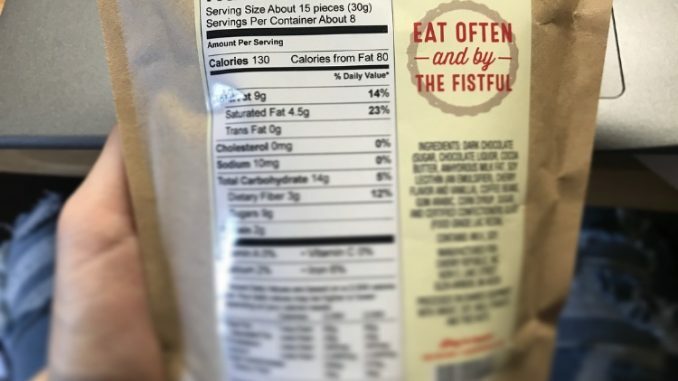 The emphasis needs to be removed from simply counting calories. Calories are a unit used to measure energy, but we give the word a bad connotation when we constantly tie it to weight loss and weight gain. We advocate living a “healthy lifestyle,” but it’s become unclear whether that healthy lifestyle is truly for the greater good of people, or if it’s simply trying to make our nation’s health trends look more positive on paper. We’ve become a society obsessed with numbers on charts, on scales and on labels. We need to revamp the way we look at nutrition. We shouldn’t just count calories to lose weight. Maybe we shouldn’t even count them at all. We should exercise daily and be conscious of what we’re putting into our bodies as a means of taking care of ourselves and making sure we’re healthy, but that doesn’t mean we need to calculate every last thing we’re putting into our systems. Life is about balance, something which is hard to maintain for both individuals with obesity and individuals with eating disorders. The issue, I think, is that we’ve taken self love out of the equation. We’ve made the issue about numbers, and in doing so we’ve created a system where some individuals become desensitized to those numbers while others become hypersensitive. Self love and self care is something that’s been stressed in almost every psychology class I’ve sought out, but I don’t think I’ve ever once heard it in a required health class. If you love yourself, you’ll treat yourself right. You’ll find that balance which is essential to maintaining a healthy lifestyle.